COSTA MESA - Oct. 29, 2009 - Playmates Toys is proud to announce its new global master toy agreement for the Teenage Mutant Ninja Turtles with Nickelodeon & Viacom Consumer Products (NVCP). The long-term partnership allows Playmates Toys to continue its phenomenally successful, 20-year tradition with the Turtles brand, which has generated $2 billion (at retail). This new alliance also lets Playmates Toys execute on its strategy to maximize global toy rights in partnership with renowned brands that leverage entertainment across multiple-media platforms worldwide. "We are very excited about our new partnership with Nickelodeon, which broadens the scope of creative inspiration for Playmates," said Lou Novak, President, Playmates Toys. “We are proud to continue our long-standing commitment of making innovative, fun toys based on the beloved Turtles that have entertained generations of kids around the world." "Our partnership with Playmates Toys adds another layer of excitement for us as we build upon the Turtles' great, funny stories and characters which have withstood the test of time," said Leigh Anne Brodsky, President, Nickelodeon & Viacom Consumer Products. "The characters have resonated around the world for 25 years, and the toys based on them are part of pop culture and continue to be relevant to today's kids." Nickelodeon & Viacom Consumer Products manages the world's third largest licensing business, representing leading properties such as SpongeBob SquarePants and Dora the Explorer, and managing merchandising for Nick Jr., Nickelodeon, Comedy Central, MTVN International, and Spike TV. Nickelodeon, now in its 30th year, is the number-one entertainment brand for kids. It has built a diverse, global business by putting kids first in everything it does. The company includes television programming and production in the United States and around the world, plus consumer products, online, recreation, books, magazines and feature films. Nickelodeon's U.S. television network is seen in more than 99 million households and has been the number-one-rated basic cable network for 15 consecutive years. Nickelodeon and all related titles, characters and logos are trademarks of Viacom Inc. (NYSE: VIA, VIA.B). It seems, paradoxically, that it has been both a really short time and a very long time since the deal with Nickelodeon was finalized and announced, but in reality it's only been about a week. In that time, I -- and the folks at Mirage -- have gone through a lot of different thoughts and feelings, but the one thing that seems to be common to all is that it is going to take some significant time to come to grips with all of the changes that this sale has wrought. 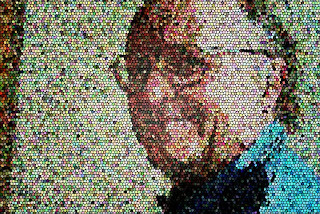 I was just chatting with Jim Lawson about this, and realized that it has been a very long time -- not the whole twenty-five years of the Turtles' existence, but definitely the greater portion of that time -- since I was NOT the person (or one of two people, when Kevin was my partner in Mirage) who was responsible for the Turtles and their "empire". It's been so long that I don't even remember what it felt like to not have that responsibility. And now I don't have that responsibility, and I realize that it is a very strange feeling... not a bad one, but a strange one. It's going to take some time to get used to it again. One thing that is becoming clear to me is that, right now, I need to really step back from Turtle stuff. I am feeling strongly that I need to distance myself from the TMNT to truly grasp what has happened, and become accustomed to it. With that in mind, I have to say that it is likely that any new TMNT comics coming from me/Mirage (under the "reserved rights" clause negotiated in the sale) are probably not going to be seen anytime soon. Although I do have the right to publish up to eighteen issues of TMNT comics per year, it is highly unlikely that I will do that right away. In all honesty, the idea of doing ANY new Turtle stuff right now leaves me cold. I need to get away from it. 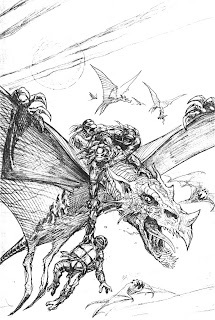 During the negotiation, I asked for those "reserved rights" because, on some very basic, gut level, after putting so much of my life into the TMNT property over twenty-five years, I wanted to walk away from it with roughly the same deal with which I walked into it -- the freedom to do some TMNT comics. But I also have the freedom to NOT do them. I've been reading a lot of the comments here and elsewhere on the Web about my recent sale of the TMNT property to Viacom, and a few repeated themes are emerging, almost all of them indicating a woeful lack of basic comprehension of business realities. I have been pondering whether I should try to respond to these comments in an effort to enlighten (as best I can), though I suspect that it could be the classic "exercise in futility", given the obvious absence of a common frame of reference. But I'll give it a shot. 1.) I just don't get all the negative crap that some people have spewed about Gary Richardson, CEO of Mirage. I've worked with the man for over fifteen years, and have found him to be an honest, ethical, hard-working person. We occasionally have not seen eye-to-eye, but that has usually been the result of the divergence of views predicated by the two very different career paths we each took after college, me as an artist/illustrator and Gary as (originally) an accountant. Kind of a left brain, right brain kind of thing. I don't think it's an exaggeration to say that, without Gary, Mirage may not have survived as long as it has. His level-headedness, knowledge of business, and facility with numbers -- among other skills -- really made a huge difference in the day-to-day running of Mirage. Gary also has an excellent memory and strong organizational skills, which -- if you are going to run a company like Mirage which owned a complex property like the TMNT, with hundreds of contracts with a wide range of licensees all over the world -- are absolutely necessary qualities. The work Gary has done to keep all of that stuff straight and running smoothly is, I think, vastly under-appreciated and poorly comprehended by many people, and particularly the world of TMNT fandom at large. And the idea that this sale was some sneaky deal cooked up by Gary and somehow foisted upon me is not only ludicrous but insulting to all concerned. It is simply beyond stupid. 2.) Another oft-repeated comment is something to the effect of "Why'd you have to SELL it? Why didn't you just let somebody run it for you, while you went off and did whatever?" I suppose there are some people in the world who have the ability to compartmentalize their lives in such a way as to be able to shut off concerns about certain key, important things. Personally, I have trouble doing that. It's actually a measure of the confidence I have had in Gary's competence at running Mirage that I was able to let go of concerns about many things having to do with the operation of the business. But there have always been certain aspects of the TMNT business that I could NOT let go of, and Gary understood this, and would always consult with me about them and get my "yes" or "no" before moving on them. And these would be the things that, regardless of who took over running Mirage for me, I would STILL worry and fret about. It's just my nature. That's why the idea of a sale of the TMNT, with a clean, unequivocal relinquishment of all TMNT-associated responsibilities, was -- and is -- so appealing to me. 3.) Another common comment is that this deal "came out of nowhere" and "happened so fast". I can understand how it may have SEEMED that way to an outside observer, but nothing could be further from the truth. Not only has the idea, the concept of a sale of the TMNT been percolating in my brain for at least the last decade, the actual work on this deal with Viacom has been going on for many months. It was a complicated, grueling negotiation with thousands of details to consider. Even Gary came close to tearing his hair out several times. And it is a generally-accepted fact of business that when you are negotiating this kind of deal, you don't talk about it in public until the deal is done. One of the things that has been tying my stomach in knots over the long course of this negotiation was that I could not tell my friends and fellow artists at Mirage about it, until roughly a week or so before the actual closing. That was tough. 4.) "You got ripped off -- TMNT's worth WAY more than 60 million!" This is another comment which has been repeated... of course, it is also one which is stated with no facts to back it up. Please keep in mind that I had consulted with smart advisers who know about this kind of stuff, who had studied and researched how to evaluate the dollar value of a property like TMNT in real-world terms. In one sense, it's kind of flattering that people would think it's worth a lot more... but it also reveals a profound naiveté about the realities of business. 5.) One of the most aggravating comments is the one which can be summed up as "How could you sell TMNT?!!! I would never sell MY property!" That's a very interesting assertion. My immediate reaction is "Great... but come back to me after you've spent twenty-five years living and working with that property to the almost total exclusion of anything else, and then I just MIGHT be able to take you seriously." People who make this type of comment just have no clue about what it is like to be involved like I was with a property like TMNT for so long. And it is that blithe cluelessness which allows them to make such bold claims. This evening, my daughter Emily wisely advised me to make a statement about the MTVN/Viacom/Nickelodeon buyout of the TMNT property on my blog... so I am going to try to do that. I suspect it won't be the last statement I will make about this subject. I will try to touch on some of the things that folks have inquired about, but I can't guarantee that all questions will be answered. First, why did I sell the TMNT? There are a number of reasons, but first and foremost is that I have been doing this TMNT thing for twenty-five years, sixteen of them in partnership with TMNT co-creator Kevin Eastman and the last nine as sole owner of the property. That is a long time. It is almost half my life (I'm 55). I never expected to be working on the same thing for this long. And it has worn me down. I am no longer that guy who carries his sketchbook around with him and draws in it every chance he gets. 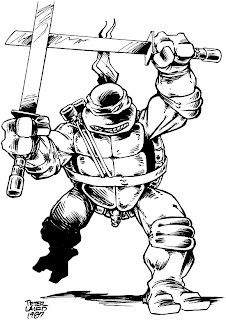 That guy did all of the pre-TMNT artwork you have been seeing on this blog in many of my "Blast from the Past" posts. I miss -- I really, really miss -- being that guy. My fervent hope is that by divesting myself of this wonderful but needful-of-constant-attention property, I might -- I just MIGHT -- get back to being that guy. Or something LIKE that guy. It will come as no surprise to anyone who has been paying attention that my energy level for things TMNT has flagged in these last few years. As one result, the production of TMNT Volume 4 comics has slowed to a crawl. That's not good. I have a conclusion planned out for that series, and at some point I want to get to it. Maybe this sale will help me get to that point. We'll see. The idea of a sale of the TMNT property to a third party is not a new one. Kevin and I, while we were still partners, discussed it during the 1990's and actually came to the conclusion that if the right deal came our way, we would take it. We got a couple of offers -- one of which was, in retrospect, pretty decent, and another which was simply ludicrous and insulting. We took neither of them. This one, this sale which was completed on Monday of this week, came out of the blue. I was not actively pursuing selling the property, though Gary (CEO of Mirage) and Fred (my attorney) knew that it was something I might be interested in should the right buyer with the right deal come my way. And then Viacom/MTVN/Nickelodeon showed interest and we started talking. I've known for a long time that at some point in my life I would sell the TMNT. I just wasn't sure when it would happen. But, as they say, in this case "the stars lined up". 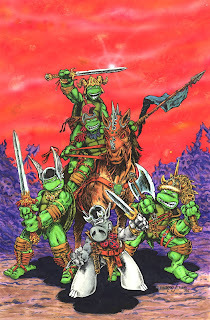 I know that many fans are concerned with how the TMNT will be treated now that they have a new owner. I am also concerned, but I have faith that the new owner will treat the property with due respect and make the most of it. And the simple fact is -- I didn't have it in me any more, and the property DESERVED a new owner. Now it has one, with powerful roots in the entertainment business. I am actually quite excited to see where they take TMNT. I am pretty certain that what Viacom/MTVN/Nickelodeon will do with the TMNT is NOT going to be what I would have done with it had I kept ownership. But is that necessarily bad? I think not. For example, if Kevin and I had had our way back in 1987, the original TMNT animated series would have been a lot different. It would probably have been a lot more like the 2003 4Kids show. Now, I really like the newer 4Kids series, but I also know that many fans much prefer the lighter, goofier original series. I don't know what the new Nickelodeon series will be like... but maybe it will be something better than either of the old shows, or simply something new and different, with a fresh approach and attitude. I think everyone should wait and see before passing judgment. One comment -- which I have seen online several times -- expresses the sentiment that this sale will mean "the end of TMNT". This baffles me. Unless I am completely naive, the sale to Viacom could very well mean a brighter future for the TMNT property than was previously feasible. 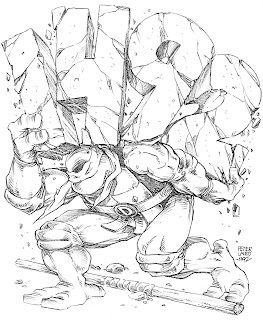 Of the covers that I penciled for the Archie Comics-published "TMNT Adventures" book, this is one of my favorites. 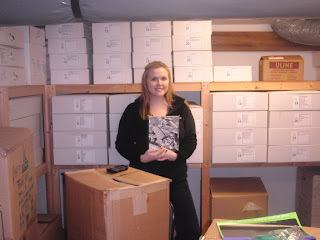 Last week, my wife and I had a treat -- our daughter Emily came home for a short visit. Em and I managed to find time to eat dinner at her favorite restaurant, Bertucci's, and go to see the movie "Zombieland", which was pretty funny. 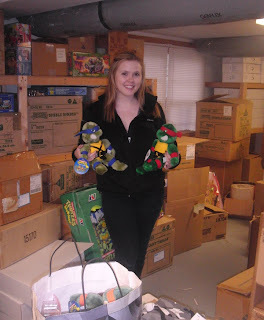 ... and a lot of it not, as in the stacks of old Playmates shipping cartons behind Em in this photo of her with a couple of plush Turtles. She eventually found enough interesting things to fill a few shopping bags. 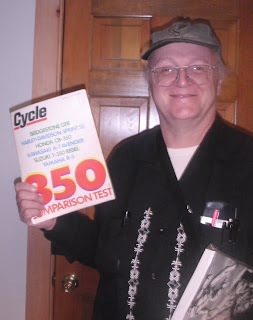 Before we left, I amused her by pointing out my stacks of old motorcycle magazines -- some of which I have saved from my high school days. 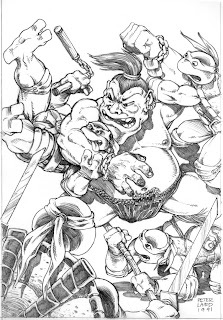 This is the cover to issue #32 of the "TMNT Adventures" comic published by Archie Comics. I drew it in 1991. 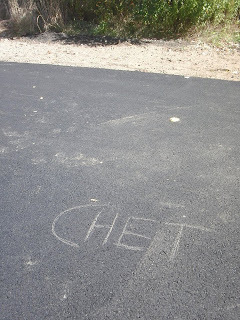 Keen-eyed readers of the original Eastman and Laird TMNT comics probably are aware that the name "Chet" pops up quite a few times in those issues. There was really no reason other than the fact that, for some reason, at that time, Kevin and I found the name humorous. I don't really know why. I can't recall precisely when this single issue of "Turtle Soup" -- an anthology of TMNT stories by a varied group of creators -- was published, but I suspect it was during that fertile period of the late 1980's. This is a bit of an odd one. 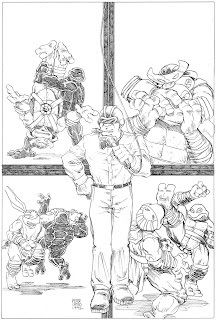 We produced this poster to promote the publication of TMNT #8, the issue which featured a crossover adventure with Dave Sim's great character Cerebus the Aardvark. Kevin Eastman was a huge fan of Cerebus and Sim, and really pushed hard to get this project together. Dave was amenable to it, and turned in some great stuff -- he did all the drawing of Cerebus in that issue as well as Cerebus' very witty dialogue.